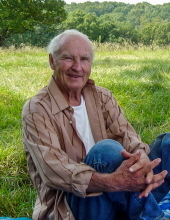 Virgil D. “Bill” Evans, 97, of Mokane, passed away peacefully on Wednesday, January 30th, 2019, at Williamson County Medical Center in Franklin, Tennessee. Bill was born on January 22, 1922 in Big Spring, Texas to Chester and Elizabeth Evans. Bill married his wife of 73 years, Agnes “Sandy” Evans, in San Antonio, Texas on February 2, 1942. She preceded him in death. Bill served in the 45th Infantry Division during WWII. As a boy, he marveled at airplanes and later was able to fulfill his passion for flying when he completed Army pilot training. During his distinguished military career, he and his family, (Sandy, son Harry, and daughter Kathryn) were stationed in Germany, Alaska, and Texas, to name a few. After retiring from the Army with the rank of Captain, Bill and Sandy moved to Cedar Rapids, Iowa. There he worked for Collins Radio in developing and selling tactical navigation systems for military aircraft. In 1978, they fell in love with a property near Mokane that had a field long enough to land their small airplane. There they built their dream of having a ranch with cattle, horses, and chickens over the next 35+ years. They called it Hidden Valley Ranch and it became the summertime retreat for their grandchildren. He continued flying for several years and participated in the local flying club. For a couple of years in the early 80’s they owned and operated the Ham’s Prairie Store. Bill was a constant learner with a curiosity for science and engineering. When he wasn’t working on the ranch with his tractor Ol‘ Blue, he was often reading about astronomy or the latest new technology. Survivors include his son, Harry of Port Charlotte, Fl; five grandchildren, Kimberlee and Will Evans of Scottsdale, Az., Suzanne Wissel of Little Rock, Ar., Ram Wissel of Franklin, Tn., and Cinnamon Hess of Bradenton, Fl. ; and three great-grandchildren, Dylan Nicodemo, Jackson Evans, and Joanna Hess. Along with his parents, Bill was preceded in death by his wife Sandy and their beloved daughter, Kathryn. A private graveside ceremony will be held for family. As an expression of sympathy, memorial contributions may be sent to the National Multiple Sclerosis Foundation. To send flowers or a remembrance gift to the family of Virgil D. "Bill" Evans, please visit our Tribute Store. "Email Address" would like to share the life celebration of Virgil D. "Bill" Evans. Click on the "link" to go to share a favorite memory or leave a condolence message for the family.